Energy giant SSE is being told its proposed huge wind farm at Strathy would kill and drive away golden eagles and other rare birds and despoil an area at the heart of the flow country of Caithness and Sutherland. The message was spelled out loud and clear at a public meeting called by the company to discuss the potential impact its 47-turbine development earmarked for a forested area to the south of the village would have on the natural environment. As reported in the Courier, the RSPB is objecting to the plans because of concern about the potential toll on nationally and internationally important concentrations of birds like golden eagles, red-throated divers and greenshanks. The nature body also fears the turbines would be bad news for the surrounding tract of blanket bog, which is subject to international conservation designations. Despite the short notice given for Tuesday night’s meeting in Melvich Hotel, people from Naver, Strath Halladale, Melvich, Forsinard, Bettyhill and further afield turned up and voted unanimously to object to the erection of the 135 metre high turbines. The scheme, earmarked to go up on a conifer plantation, was downsized from the original intention to put up 77 turbines. Several of those present alluded to what they claim is the irony of replacing one of the last remaining blocks of inappropriate forestry in the flow country with a wind farm which would be equally environmentally unfriendly. Paul Butterworth, who has lived in Bettyhill and studied the birds of the area for 30 years, claimed the only reason the proposal had been progressed was the incentive of big money pay-outs. He said: “Knowingly killing protected species by placing a wind farm in the heart of one of the best areas in the UK for birds and other wildlife like wildcats is just a nonsense. Kenny Graham, RSPB Scotland’s conservation officer for Caithness and Sutherland, said this organisation had been advising SSE and its agents to drop the Strathy South site from its portfolio from the outset. “We are committed to renewable energy development but it has to be at the right scale and in the right place and this is simply wrong. 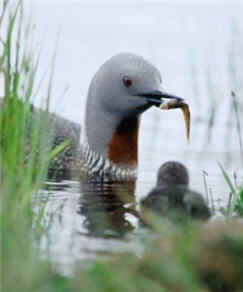 “RSPB will be maintaining their objection to this development and we would encourage others to do likewise. The deadline for the public to object to SSE’s plan is today but representations made after that date may still be considered. Melvich Community Council has been granted an extension until October 7 and is currently canvassing opinion before firming up its stance. A consented 33-turbine wind farm at nearby Strathy North is meanwhile under construction.